Can you believe this is my blog’s first recipe featuring pineapple, even though it’s by far my favorite fruit? It’s probably because I usually just stand at the counter and eat it like candy. 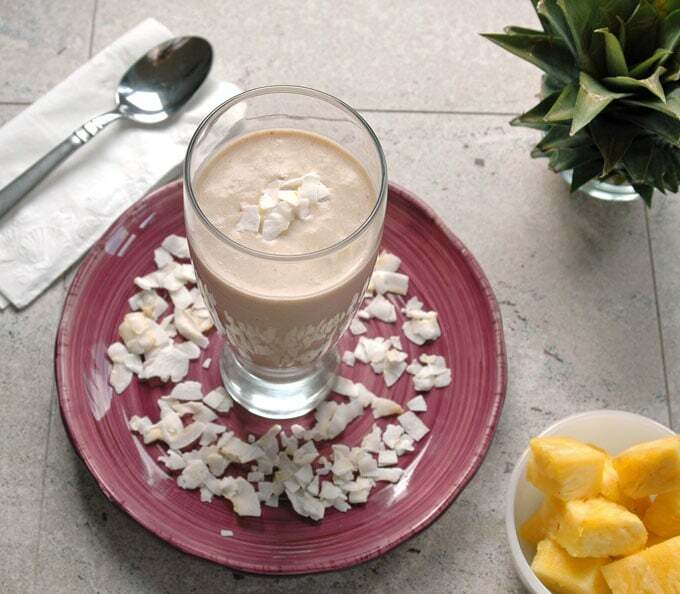 But I do make this Piña Colada and Banana Breakfast Smoothie, and if you’re a lover of pineapple and coconut, you’ve got to try this! It’s a taste of tropical heaven, and it’s healthy and vegan to boot. I start with a ripe banana and add fresh, juicy pineapple chunks, light almond milk, unsweetened coconut, walnuts, oats and coconut extract. I top it with ice and whirl it in my blender until it’s like a virgin Piña Colada. Yum!! For research purposes, I did try some with a shot of coconut rum in the afternoon while snapping my photos. So, if you prefer to make a “naughty” version of this smoothie after a long day of work and call it dinner and a cocktail…I think that’s perfectly acceptable. A bit of tropical heaven, without the guilt. Healthy, vegan and gluten free. If starting with a fresh, whole pineapple, twist off the green top and discard. Trim off the ends with a sharp knife and stand up the pineapple. Starting at the top, trim off the skin a section at a time by making downward slices. Trim off any hard parts and use a small knife to pick out the seeds. Discard the skin and seeds and rinse your cutting board. Rinse your knife and pineapple and pat dry. Stand up the pineapple, and starting to the right of the core, slice downward. Rotate the pineapple and continue slicing downward around the core. Discard the core and cut the remaining pineapple into chunks. 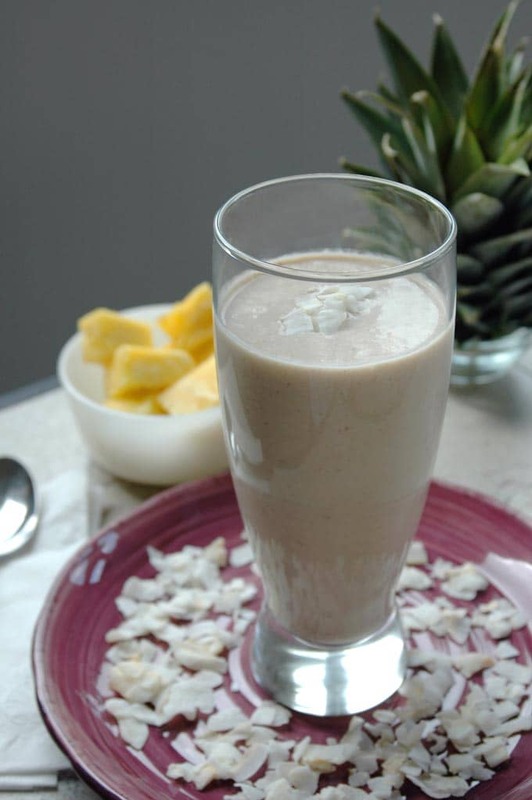 Try this smoothie with coconut rum after 5 p.m.! 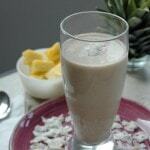 Oh my goodness, it must be a pineapple smoothie kind of weekend! I love your smoothie and need to add the banana next time. I used mango in my pineapple smoothie this weekend, but either way isn’t pineapple just the BEST? I’ve also fallen deeply in love with almond milk! Gosh, this sounds good! As does the addition of coconut rum after 5:00 pm. 🙂 Such a fun summer smoothie! Thanks, Andrea! It’s always 5 o’clock somewhere, right? 🙂 Thanks, Annie! Pineapple and coconut pancakes?! Yes, please! Thanks, Cheryl! Love this summer-style smoothie! Looks delicious, Andrea! It’ so hard to eat healthy food on work trips, isn’t it? This smoothie looks like the most delicious way to get back into the swing of things! Hope you’re having a great long week-end! The portions are huge at restaurants! I’m glad to say I’m back on track, after three days of healthy eating. Thanks, Denise!